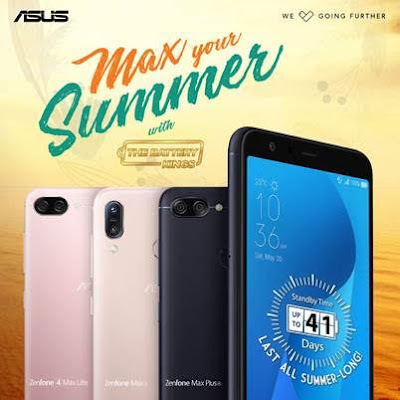 BoyRaket.com: IT’S THE LAST HURRAH TO #MAXYOURSUMMER WITH THE ZENFONE MAX SERIES! IT’S THE LAST HURRAH TO #MAXYOURSUMMER WITH THE ZENFONE MAX SERIES! The ZenFone Max Series is here and ready to help you maximize the last few days of the summer season. Whether it’s just spending the time binging your favorite shows, ticking off items on your bucket list, or traveling around taking breathtaking photographs – there is a ZenFone Max made for everybody! Moreover, with the battery life each phone is widely celebrated for, these ASUS Battery Kings will keep you powered throughout the long days and nights without a hitch – all summer long, and beyond! The first Battery King to make its grand entrance in 2018, the ZenFone Max Plus M1 sports a 4,130mAh battery that is enough to last for days. On top of this, there is an 18:9 full view FHD+ display seated inside a slim and elegant size, 5.7 inch body of premium metal finish and 2.5D-curved front edges. With this particular Max variant, you’re sure to enjoy an immersive viewing experience of all your favorite shows, all day and every day! And so if you’re the type who would rather #MaxYourSummer indoors and in the comfort of your beloved characters up until the very last second, get the ZenFone Max Plus now! Fuel your passion points with the second Battery King to enter and change the game this year! Known as the Battery King for Game Changers, the ZenFone 4 Max Lite is the more compact sized brother of the well-received ZenFone 4 Max. Powered with a 4,100mAh battery, with this ZenFone Max as your daily driver, you won’t have to worry about low-bats on days and activities you absolutely need your phone to be alive and kicking. Without a doubt, with this very special Battery King, you can go on adventures of all kinds of sizes to #MaxYourSummer out! The most recently crowned king, the ZenFone Max M1, is dubbed to be the Battery King for Photography. This incredibly compact sized of a Max is not only running on 4,100 mAh battery that should be enough to boost you for but is also designed with a 13MP+8MP wide-view dual cameras, best for capturing any scene in-frame. Its13MP selfie camera is something to watch out for as well, with its Spotlight LED flash and with the help of theSelfieMaster™ technology, your selfies are sure to look flawless! So #MaxYourSummer now with the ZenFone Max M1 and take great photos to last the season forever. The newest ZenFone Max Battery Kings are available nationwide, ready for an action-packed summer with you! You can get the ZenFone Max Plus M1 just for PHP 11,995.00 or for 0% 6 months on Home Credit, to enjoy the best of an immersive view. You can also fulfill all kinds of passions with ZenFone 4 Max Lite for just PHP 7,995.00. For your daily photography needs, the ZenFone Max M1 is just for the affordable price of PHP 8,995.00!